"Shadow Moon" Eagle Falls- Emerald Bay Lake Tahoe, CA. 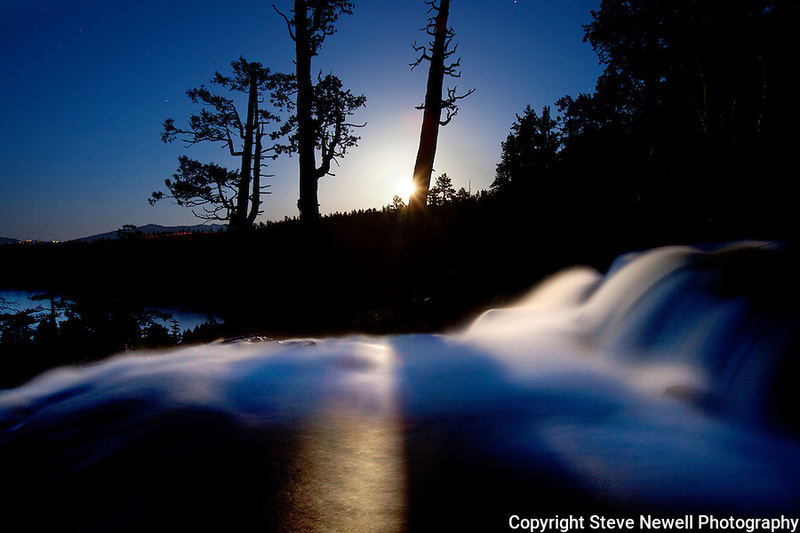 This is a full moon rising over the Lake Tahoe Basin on May 5th, 2012. This image was taken at 8:51pm. I used a 30 second exposure, f8.0 aperture, ISO 400, 21mm lens. In Lake Tahoe Emerald Bay is the most photographed location. You can find many different photographs of the sunrise with Lower Eagle Falls in the foreground that have Fannette Island included along with the sun rising over the ridge in the background. So I went out and shot a Full Moon rising over the waterfall. I used a 30 second long exposure to capture the available light in the area and it gave the water a milky flowing in motion look. With the sun setting farther down and the moon rising higher the sky started to turn darker thereby changing the color it reflected on top of the waterfall. The moon light cast the shadow of the surrounding trees across the waterfall. More stars can be seen in the sky, the car on Emerald Bay Road started moving so the lights have a streaming tail and house lights on Kingsbury Grade can be seen in the background.